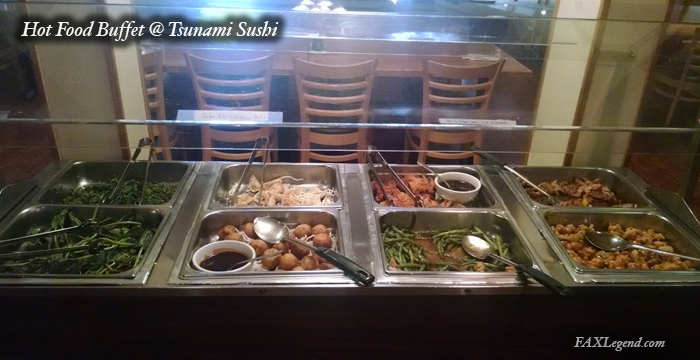 Tsunami Sushi is a small sushi restaurant located inconspicuously in the Fair Lakes shopping center next to Toys R' Us. I've never heard much about it but the place is well known in the area for their all you can eat lunch sushi buffet ($15 after tax). 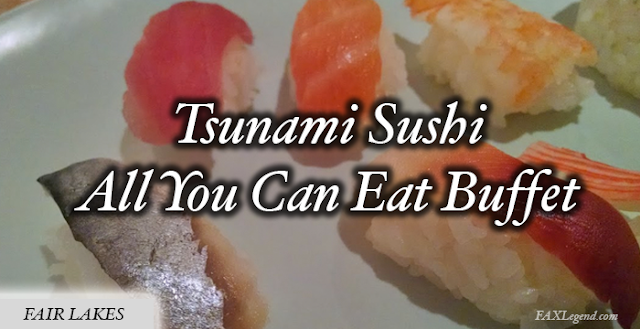 I went down to Tsunami to check it out and find out what the hubbub is all about. The buffet runs every day except Sunday, with Saturday a fairly new inclusion, from 11:30am - 2:30pm each day. Its a nice little spot with mediocre but good enough food and sadly some disgusting customers. One woman coughed into her hands, grabbed a plate, decided that plate wasn't for her, and grabbed another plate leaving the cough plate on top of the pile for the next person to grab. There was tons of coughing and sniffling heard throughout the restaurant from the old people. One guy blew his nose in a tiny napkin, wiped his hands on his clothes, and then went back to his seat. You could tell these people are here often because they talk to the staff like they've been there before. Its gross. Get there when they open at 11:30. So back to the buffet. 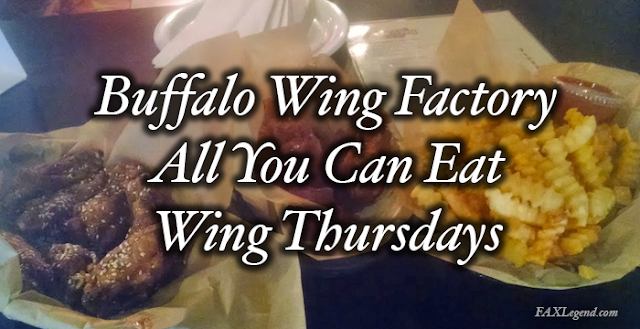 The all you can eat spread consists of basically 4 different sections. The nigiri sushi (the ones with the fish on top of the rice), the sushi rolls, the hot food, and the sides. On the Nigiri side, they offered 10 different items. If you've ever been to a sushi joint before you will immediately realize that these are some super small thinly sliced fish. However they don't overdo on the rice and it still ends up tasting pretty good. 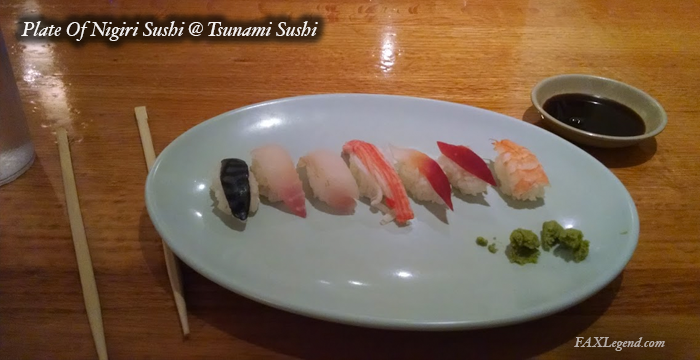 You are going to find your basic sushi selections here like imitation crab, shrimp, tuna, salmon, etc. If you go to a non buffet spot the sushi will taste better, but this does the trick when you are looking to fill your stomach for cheaper. The roll side offers something like 12 different rolls. They've got the basics; california rolls, avocado rolls, and cucumber rolls. They've also got a bunch of other ones that I've never heard of. Quite frankly they all taste exactly the same to me. The hot food section in the middle has something like 8 different items. Items included orange chicken, teriyaki chicken, spinach salad, and something really strange called octopus balls that I was not going to put into my mouth. Fairily generic and plain tasting. 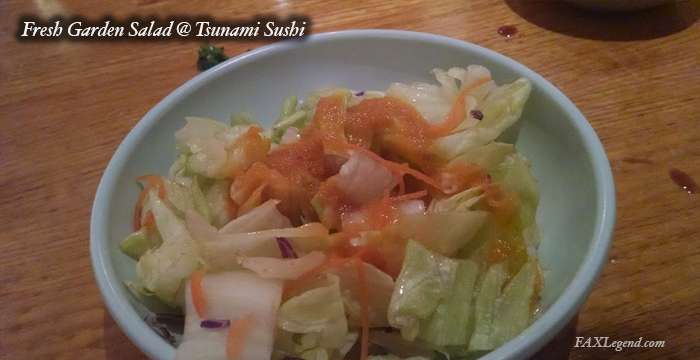 They also have a side section that includes generic garden salad with ginger dressing, miso soup and orange slices. Now that you know what you are getting for your $15 (I get a $0 water and leave a $2 tip), you also have to know more about the establishment and the crowd. There are several customers in suits/work clothes grabbing lunch during their break. There are also several customers who appear to be regulars (older people) who sit and read the newspaper and just chill out trying to eat all the food they can. The disgusting ones described above. Overall this is a fairly expensive lunch ($15-$17 without a drink). You do get a lot of food but there isn't much variety and you can only eat so much of it before you get sick of it. I've got a few other sushi joints where I can eat the same amount of food I had at the buffet for cheaper that includes much better tasting sushi. We can also have a discussion later about tipping at the buffet, but this place the ladies are on point filling up your drink when low and getting your old plate off your table before you sit back down with your new plate. I tipped $2 instead of 20% ($3). Not sure if that is right as I know those gross regulars tip $0 every time. 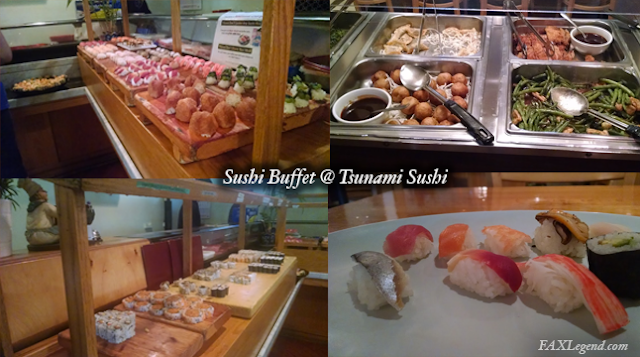 If you've never been to a sushi buffet before (like me) then try this one out once. After that you will probably make the same decision I did. That you will not be returning. Welcome to happy hour at the Whole Foods Sports Spot. This sports bar (more like cafeteria/beer garden) with a great patio is located in the lobby of the Whole Foods grocery store in the Fair Lakes area. They offer a full food menu (with good daily specials), beer and wine, and 12 craft beers available on draft. For the first 3 days of the week (weak!) they offer happy hour specials on their draft beers. 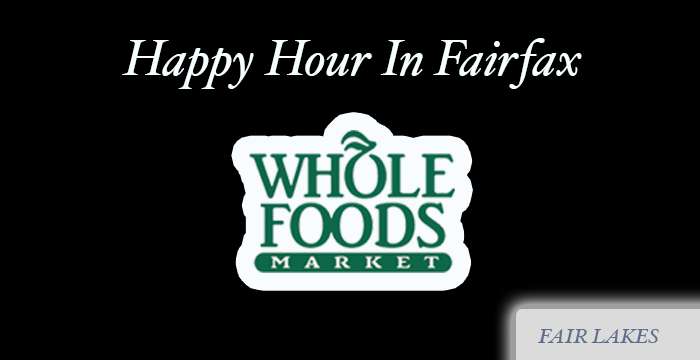 Here's everything you need to know about happy hour at Whole Foods Sports Spot. Hanging out in a grocery store may seem odd. But if you stop by Whole Foods (Fair Lakes) on Wednesday evenings you will see a whole lot of people doing it. 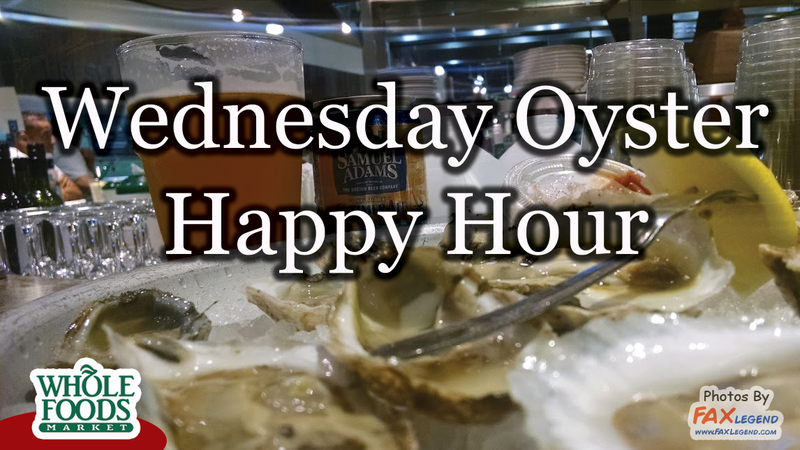 That is because on Wednesdays, the grocery store offers a very popular raw oyster happy hour featuring great specials on raw oysters, steamed shrimp and really cheap cans of craft beer. And the best part is, no tipping allowed at Whole Foods.